In stock proven top sellers great for county fairs, western festivals, tack/western shops & musical concerts or anytime when sun protection and fun collide. Modestone, a trusted name brand in quality western clothing & accessories for over 25 years. Contact us to specify the style/sizes you prefer or if you wish, allow us to make a winning assortment for you. We will send from 6 to 10 styles pictured, each with a size spread. 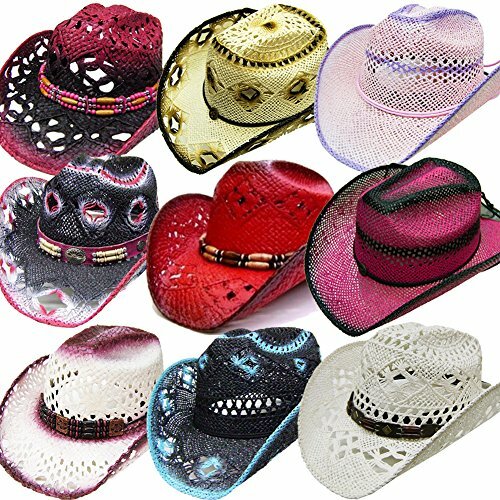 Sizes S-L, this line of classic styled hats are the mid-level bread & butter cowboy hats popular year after year. With elastic sweatband for a comfortable & snug fit everytime. Our hats feature attractive antiqued finishes with deep & vibrant colors. Stiffened for durability & to maintain shape. Wire in the brim for custom shaping. Hatbands & color shades may differ as they are handmade. Brim 3", Crown 4 1/2". For hat size measure around head, just above eyebrows & ears. Hat Sizes: XS=21 1/4'' | S=21 1/8''-21 1/2'' | M=21 7/8''-22 1/2'' | L=22 5/8''-23 1/4'' | XL=23 1/2''-24''. Fully covered under NAFTA no Duties are charged. Buy one of our other Modestone Western Accessory Combo Packs of Men's & Women's Straw Hats, Leather Cowboy Hats, Rodeo Straw Hats, Hand Tooled Leather Gunbelts & Western Buckles to go with this fine Modestone Straw Cowboy Hat Combo Pack. In stock proven top sellers great for county fairs, western festivals, tack/western shops & musical concerts or anytime when sun protection and fun collide. Modestone, a trusted name brand in quality western clothing & accessories for over 25 years. Contact us to specify the style/sizes you prefer or if you wish, allow us to make a winning assortment for you. We will send from 6 to 10 styles pictured, each with a size spread. Sizes S-L.
With elastic sweatband for a comfortable & snug fit everytime. Our hats feature attractive antiqued finishes with deep & vibrant colors. Stiffened for durability & to maintain shape. Wire in the brim for custom shaping. Hatbands & color shades may differ as they are handmade. Brim 3", Crown 4 1/2". For hat size measure around head, just above eyebrows & ears. Hat Sizes: XS=21 1/4'' | S=21 1/8''-21 1/2'' | M=21 7/8''-22 1/2'' | L=22 5/8''-23 1/4'' | XL=23 1/2''-24''. Fully covered under NAFTA no Duties are charged. Buy one of our other Modestone Western Accessory Combo Packs of Men's & Women's Straw Hats, Leather Cowboy Hats, Rodeo Straw Hats, Hand Tooled Leather Gunbelts & Western Buckles to go with this fine Modestone Straw Cowboy Hat Combo Pack. If you have any questions about this product by Modestone, contact us by completing and submitting the form below. If you are looking for a specif part number, please include it with your message.